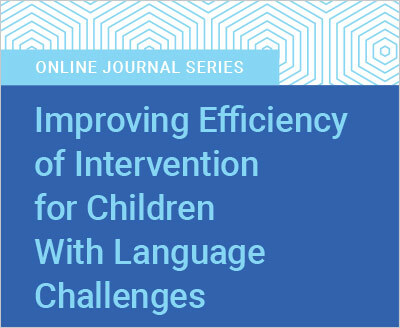 A significant proportion of treatment research aims to determine whether particular interventions are effective in addressing children’s language deficits, but just as important are ways to increase efficiency of these interventions in practice. The articles in this journal self-study examine a range of variables that promote efficiency. The first article manipulates two parameters of dosage—rate and distribution of teaching episodes—and compares the effects on vocabulary learning in preschoolers with autism spectrum disorder. The second article examines the dosage parameter of schedule (massed or distributed) on an intervention targeting grammatical morphemes in preschoolers with specific language impairment (SLI). The third article examines adequate intensity for vocabulary acquisition for children with SLI during interactive book reading. A final article demonstrates how the addition of one training component in early educator professional development leads to greater efficiency in children’s responses to the same intervention presented in the third article.